As we approach the end of October the season is ripe for honoring our beloved ones who have passed with traditions such as the Mexican holiday Day of the Dead being just one of the many. Ultimately we can choose to honor or celebrate our loved ones’ memories in any number of ways that feel sacred and important to us depending on our beliefs. Typically, in our culture we have a funeral or a celebration of life that is shared with others. Sadly, beyond those initial ceremonies it seems that we are left on our own to grieve in the shadows. I have created and been a part of several grief rituals and ceremonies honoring my husband since his suicide. One of the most powerful experiences I had the privilege to participate in was a weekend “Grief Ritual” workshop with the late Sonbonfu Some. Her teachings come from her own Dagara tribe in West Africa. When one member of the community loses a loved one the community as a whole grieves with them. One is never left alone to grieve in silence. In fact, allowing your feelings to rise and be heard is encouraged. During our grief ritual weekend, we got to experience what this could be like. Through the grief ritual itself we were given permission to cry, scream, wail or just sit silently with our pain. All the time being witnessed and held in love literally and energetically by our “community” members. It was an honor to bear witness to such raw emotion and to be present with the grief that so many of us share. Because my husband Claude was cremated I had the luxury of waiting about six weeks after he transitioned to have his “Celebration of Life” gathering. I allowed myself the space and time I needed to gain some strength and prepare emotionally. As a result, I was able to be more present and appreciate the experience to a greater extent than I would have earlier. I think this set the tone moving forward of learning and honoring what I needed to take care of myself while I was healing and grieving. In addition to honoring Claude through his Celebration of Life I had a dream which was to spread his ashes in San Francisco Bay. It made perfect sense since we met there and spent many hours sailing on “The Bay”. Sailing was Claude’s passion, his place where he felt the most at peace. As if by magic my dreams were realized almost a year after his death when everything fell into place. We were able to go out on a sailboat in San Francisco Bay to have our ceremony. A few close friends who had known Claude where able to join us, the circle was complete. As if by magic once again, the weather that day was picture perfect and the bay was uncharacteristically like glass. I was grateful for the calm and peaceful waters which served us well enabling us to have a tranquil ceremony honoring Claude. I bought an elegant biodegradable container that held his ashes. After Noah dropped them into the water we released purple rose petals that we considered to be our flowers. I chose a song by Loreena McKennitt’s, called “Dante’s Prayer”. It played as we watched the petals slowly drift away on the waters gleaming mirror-like surface. My mission was now complete. I felt that Claude was smiling with me and was happy that we had done that for him. Over that first year I developed a new relationship with how I had previously viewed his death. Rather than viewing his actions of committing suicide as something horrific I came to view this as something that we all ultimately decide as divine beings, how we choose to die. Looking at it from this viewpoint helped me put his actions into a broader understanding. I chose to honor his decision with another ceremony on the first anniversary of his death. I had a lot of regret that I was not able to be with him when he took his final breath. It truly pulled at my heart that he died in such a grim manner feeling so alone and downhearted. I set up a chair in the doorway just outside the room to the attic in our home where he hung himself. At this point in time I had worked through much of the fear around that room but I would always feel some level of uneasiness being in and around it. I had an insight one day that helped me with that distress. I was shown that this room where he died was simply a portal in which his spirit passed through to another dimension. This realization helped me re-frame my perspective diffusing much of the previous attitude towards that space. I set up an altar on the floor below where I found him. I burned sage. I played that hauntingly beautiful song again, “Dante’s Prayer,” just as I did on the boat. I sat in the chair and imagined him going through the motions of getting ready and ultimately reaching the point of no return, his death. I was sobbing the whole time wondering if I was crazy to be doing this but it felt important. It was healing for me to imagine going back in time, lovingly being fully present with him and supporting him as he made is transition. This was the only way I could think of to make peace with that part of myself that desperately wished I could have been there for him as he was dying. I am glad I followed my impulse to do this even though it was excruciatingly painful to go through. Once I was through the fire of those emotions I felt soothed and a sense of relief washed over me. I had healed another piece of my heart. I attended a weekend grief camp about 13 months after his death. During those two days there were many ways in which they helped us honor our lost loved ones. The most awe-inspiring being the balloon ceremony. Attached to each balloon was the name of our loved one. As each balloon was released into the air their name was spoken. It was a powerful heart opening ceremony leaving us all in tears. It was a perfect example of how something so simple can feel so sacred. We can create ways to honor them and keep their memories alive in our daily lives by highlighting some of the things that were most notable about their time with us. For example, my husband was known to be a generous man. With this in mind I honor his memory by finding ways to incorporate generosity with others when I feel called to do so. My son Noah has declared many times that he intends to live his life in a manner that would make his dad proud in so doing honoring his memory. Another simple yet meaningful thing we can do is to keep an altar honoring our loved ones in a special spot in our home. For a time, I felt comforted by doing this. I put the ashes that I kept together with a favorite photo of us, a candle, our wedding rings and a few other things that felt appropriate to have there to remember him by. When we moved to Boulder a year and half later I chose not to have another altar. I needed to have a fresh start which didn’t include holding onto the past. It felt like a time to honor how far we had come on our journey during the two years since Claude has died. I hope you have been inspired to find ways to honor your beloved passed loved ones. They are never far from us and will always appreciate your loving remembrances and gestures. I would love to hear from you. What are some things that you have done to honor your beloveds? ~By Choosing to Heal after a significant loss we are setting the stage for our transformational journey through grief. 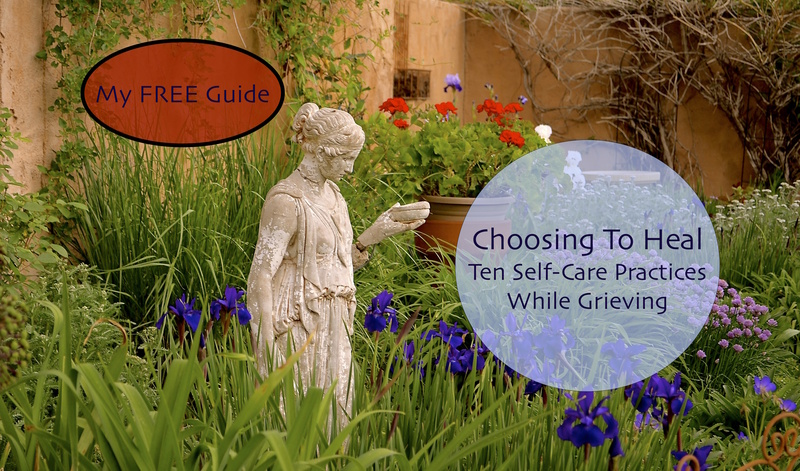 In my FREE Guide: Ten Self-Care Practices While Grieving, I offer a road map to guide you through this most tender and challenging time of your lifes’ passage. To recieve my FREE Guide and SUBSCRIBE/FOLLOW my blog with my latest blog posts delivered directly to your inbox simply click on the SUBSCRIBE button at the upper right side of this page or below, depending on your device. This is such important information to share. I’ll be sharing your blog with my tribe. Keep shining the LIGHT for those hurting in the DARK, dear one. Thank you for such honesty Kara. When we lose loved one’s it can be hard to talk about, let alone write our story. You have gained new perspective, made peace with Claude’s choice and started a new life. I say you are truly Living in Courage! Blissed Blessings to you and your son Noah. Kara I so love your name because it’s the name of my business and I love the meaning😊 it can be hard to grieve when we loose someone because society tends to look at you as weak when you break down. Am glad you came in contact with an African tradition. Here we mourn together and it is alright to cry and scream😊. We have a sense of family and support in our moments of grief and it can be so comforting when you loose someone. Am glad you shared your story with us. Thank you for this beautiful and supportive post.